Life in the Clouds: To the highest point in Central America and back! To the highest point in Central America and back! Our first week here in Guatemala can only be described with one word: amazing. As time goes on, we've grown more accustomed to life here in Sololá and the surrounding area. We've traveled to the neighboring villages to help out with classes and lesson planning, played pick-up games of soccer with the students in Basico, socialized with other residents in Pana, negotiated in the market for fruits, veggies, and souvenirs, and hopefully improved our Spanish along the way. Some of us, including myself, have even been taking some Spanish lessons from native speakers in Pana. I definitely appreciate the help! This weekend we traveled as a group to Xela and had the incredible opportunity to hike Tajumulco, the highest peak in all of Central America! Without knowing exactly what was in store for us in this 2-day hike, Christina, Michelle, and I signed up, as well as the PDs and some of their friends. So, starting at 4am this past Saturday, we traveled to the base of the volcano and started to make our way up the 17,000 feet with 45 pound packs on our back and lots of nervous energy to go around. Our four awesome guides from Quetzaltrekkers encouraged us all along the way, with David Green sprinting in front, and myself inching my way along in the back. Regardless, we all made it up to base camp to enjoy a very cold night in tents with food and good company. 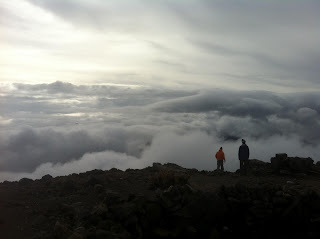 Although it was too cloudy to see sunrise the next day, we finished the last hour of ascent to Tajumulco's peak early the next morning, took plenty of incredible pictures, and then returned to camp to pack and start to make our way back down the volcano. I think I can speak for everyone that we all feel very accomplished to have conquered Tajumulco! And although I returned to Xela with two very sore legs and a sprained ankle, I also returned with having met some incredible people. And that goes for everyone on this trip. We've recently discovered Karianne's amazing talent for music and insisted that she sing us to sleep every night. I'm so blessed to share this experience with the five other interns and our PDs, who are all so much fun and add so much to the group. We've all decided that Dana is an awesome leader and we're so lucky to have her kindness lead the way! Needless to say, it has been an AMAZING week. I can't wait to see what Guatemala has in store for us next!